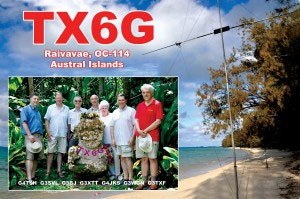 The Six-Gs first DXpedition was to the island of Raivavae in the Austral Islands, as TX6G. Some 77,000 QSOs were made in some 12 days of operating. All were uploaded to Clublog and LOTW during the expedition. QSLing Nigel G3TXF did his usual amazing job with the QSLs. All direct and bureau cards requested (by mail, OQRS, etc) were processed within 4 weeks of our return from the expedition. A full report, along with some photographs, appears on Nigel’s website.